This Small Red Kite Yurt with its Krgystan Felts above has been offered to us last minute through friends and friends of friends. And the owners of Craigiebield Hotel kindly offered us let it be pitched there dor the full 8 days of the Coming Together Festival as our PDAF Venue #1! TRUE VOICES: Poetry and Music with Aonghas MacNeacail, Janis Mackay and others tbc. And there will be other professionals as well as volunteers and impromptu gatherings of artists creating a community currency we hope to be very proud of. 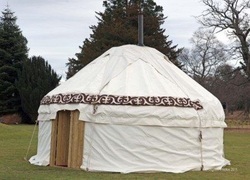 Check now on the Summary Caledar to get roughly an idea where there might be free spaces, and check back on this page for the updates in the emerging Yurt Circlings schedule.